Japan continues to grow unabashed in 2019 following a strong 2018. Unlike western economies such as the UK or the US, the consumption quotient of the Japanese economy is a lot lower and exports and investment have been driving a significant portion of the improvement in Japanese growth. We expect that to continue into in 2019 as the plans for the Tokyo Olympics in 2020 come together alongside additional expenditure from the Japanese corporate sector. The main risks for the Japanese economy stem from trade concerns and a deterioration of the country’s relationship with the United States and China. More importantly, the relationship between the United States and China is likely to remain rocky and ructions here will have an effect on Japanese exports. Similarly, the Japanese car sector is extremely exposed to the imposition of additional tariffs on cars, something that will likely form a large part of the US-Japan trade talks that are due to begin again in the New Year. The political climate has not shifted markedly in recent years although the support for Prime Minister Abe has softened slightly. We have nationwide local elections in April 2019 and upper-house elections in July 2019 and both will help shape the stance of both parliament and the Bank of Japan. Interest rates aren’t going anywhere in Japan for a number of months and we expect the Bank of Japan to continue its policy of normalisation by allowing yields on Japanese debt to rise further in 2019. The yen’s fortunes will largely follow the outlook for global investment appetite, and we make the case that the wider dollar rally and the likely constriction of the global economy following a further slowing of the global trade picture will see USDJPY trade down towards 110.00 in 2019. 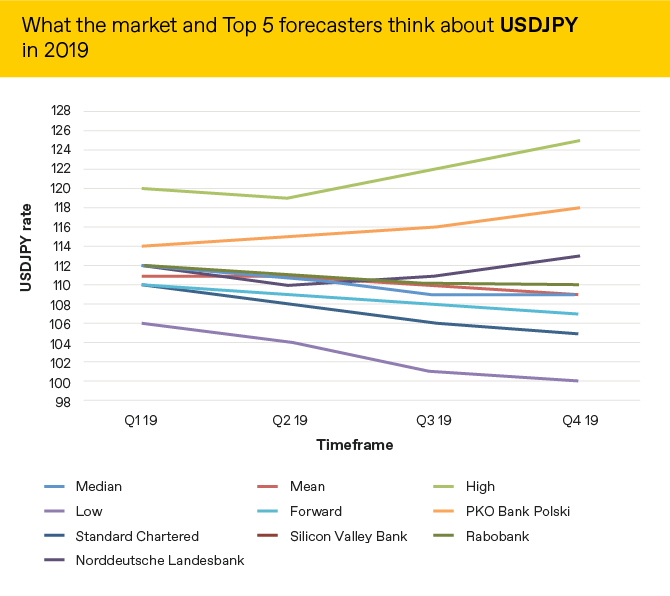 Market expectations of what will happen to the JPY versus the USD are below alongside the predictions of the 5 most accurate forecasters as measured by Bloomberg. What do we think will happen to the Indonesian rupiah in 2019?